Like rival leopards turning at bay against hunters, these two savages made common cause against the inhuman powers of antiquity. After releasing The Complete REHupa in August of 2006, I wondered if that digital archive would reduce the value of the paper mailings. Don Herron assured me it wouldn’t. “True collectors need the paper,” he said. I knew that logically he was right, that there is something special and tactile about holding a mailing in your hand, perusing the different styles of paper, appreciating the full-color zines. None of that translates to a B&W digital format designed for quick ‘n’ dirty reading and printing. But how many of the collectors out there have been scooping up mailings solely to read the contents, and how many to have them joining their first editions and other miscellany in their collections? If there are far more of the former, would that lower the average selling price of the mailings as The Complete REHupa made its inexorable spread throughout the REH fandom sphere? In a way it was a moot point to me, as I am determined to get rid of my old mailings regardless. I’m the kind of guy who, with very few exceptions, is as happy with an e-text as I am with a real book. I just want the words — the magic is created in my mind, not in the quality of paper or the art of a published book. There are exceptions to this, and occasionally a book I really like speaks to me in such a way that I want to have it on the shelf. But I can’t stand clutter and vast areas of my living space taken up with books I seldom read, and I am about as far away from the packrat mentality as can be. So now that The Complete REHupa is finished through mailing #199, the large stack of mailings I accumulated in my research has to go. Far better to find them a home where they will be cherished and well cared-for. As I prepared to offer them on eBay, I mused whether they might now go for a much lower price than they went for as recently as early last year, when $50-$100 was the average for the mailings I sold. A couple years ago the average price was $20 per, but as of last spring that price point was way out of date. Clearly a jump had occurred due to increased interest in Howard and increased education among collectors about the essential value of these mailings. Heading into 2007, would all of that hold? Or would we see prices slipping back into the old range? 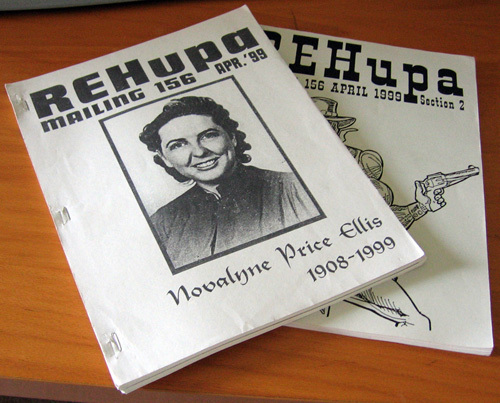 REHupa #156 (April 1999) is an important mailing both due to its coverage of the death of Novalyne Price, and to the inclusion of Pictures in the Fire, a great booklet detailing all of the known photos of REH at that time along with all of their published appearances. That’s not to mention the usual plethora of other items included in the typical mailing. This one sold on eBay for $46.75, which many behind-the-times fans consider excessive but which I consider a steal. I anticipate special mailings like this going steadily up-up-up in value as time goes on. 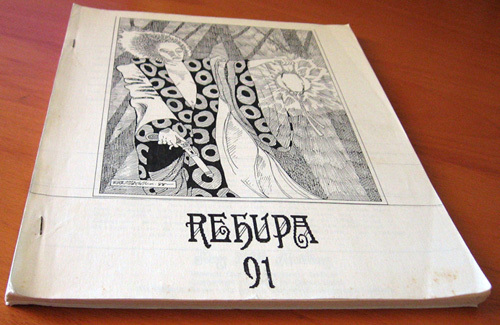 REHupa #91 (May 1988) is the infamous “lost mailing” of REHupa, formed out of ‘zines culled from the four winds of the a.p.a. after the Official Editor vanished with all the a.p.a.’s assets: mailings, treasury, even the stapler. It didn’t get mailed until a year after the event, and then only to those who were members at the time the crisis occurred. As such it is a truly rare mailing with a particularly small universe of extant copies. After some furious bidding the auction ended with this one selling for $158.52, which some people gasp at but which I think is a fair, even cheap price. I’ve seen far less go for far more on eBay, and this is a true Howard collectable that one is not likely to see for sale very often. When at least two people are ready to shell out $150 for it, that says something. So it looks as if Don’s oft-stated claim of being “right 95% of the time” still stands, and the savvy collectors out there are indeed still enamored with paper. I’ll be unloading the rest of my REHupas in the coming weeks, and will be interested to see what some of the more recent mailings go for. A copy of #185 just went for $15.50 on eBay, a real steal for the lucky guy who snagged it. It won’t be long before that one feels as old and rare as #91 and #156, with the prices creeping up accordingly. I can’t say it enough: all of these collectors beaming with pride over their copies of the Arkham House Skull-Face and Others and their copies of the Cryptic chapbooks aren’t even in the running anymore. The real giants of the field are on to much rarer game: the Jenkins Gent from Bear Creek of course (another book which I, a non-collector, have owned at one time), but also “almost-but-not-quite impossible” feats like a complete collection of REHupas, which when taken together contain many first edition appearances of original REH and serve as a running history of Howard fandom and publishing for the last thirty-five years. My sense is that right now there is a reshuffling going on in the Howard collecting sphere, with mailings being passed around to a new group of people eager to get them. Once these errant mailings are all safely tucked away in various hoards, they will become really scarce on the open market for a long while, until those collectors start dying off. In addition, Howard is being reseeded into the popular culture with movies, comics, and books. A second boom is clearly underway, at least in our little niche world, and if one or more films are successful then the Boom can spread worldwide, with many more people than ever before becoming interested in Howard. Once that happens, $200 for one of those mailings will seem dirt cheap. That’s my call, anyway. We’ll see what happens. I’ll be posting a more official and thorough schedule at REHupa.com soon, but here’s the basics to whet your appetite and start your planning. Join Leo Grin on a special caravan trip to some of Howard’s favorite haunts — Fort McKavett, Enchanted Rock State Park, Fredericksburg and all the beautiful Texas countryside that inspired the fictional land of Cimmeria. Leaves Jean’s Feed Barn after breakfast and returns to Brownwood for a late dinner. 9:00 – 4:00: Howard House Museum open for tours. Closed for lunch. I’m actually pretty excited about this year: the day trip will be a blast (Don Herron and I already did that one a few years ago as a test run), the catfish dinner will be a nice change from the usual banquet fare, and the more fannish panels from a roster of mostly “new guys” sound like a lot of fun. I’ll never understand eBay buyers. Don’t they do even a bit of research before they toss bids down on things they know nothing about? 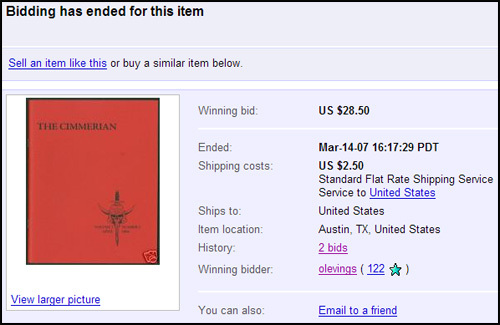 The latest weirdness happened today, as a Limited edition issue of The Cimmerian V1n1 was snapped up by a buyer for $28.50 (hat tip: Brian Leno). The seller — dmacmaniac from Austin, who I assume is Dennis McHaney of the REH Inner Circle — even notified buyers that the issue in question had an unseemly spot on the cover. And as far as I can tell there are no signatures on this issue or anything else to make it special. So what’s so weird about this, you ask? Only that this issue in this edition is still in print on The Cimmerian‘s website for $10. I would expect the price on these to go up once they sell out, but for someone to buy this today at this price blows my mind. There’s only 49 left –I’m looking forward to seeing what happens to the prices once these are no longer available. I still recall the way that Joe Marek’s New Howard Readers shot through the roof once they went out of print, and those had such terrible production values that I refused to buy them on principle. Thank God I’m not a collector, else I would have been forced to buy them. Ewwww. That first issue of TC is still one of my favorites. My editorial was more right that I ever could have imagined in 2004 — I’m glad I made it as brassy as I did. Don’s article was at the time decried by some readers as malicious and inflammatory, but in light of subsequent events — Wandering Star’s implosion, Del Rey’s stalled hardcovers — his predictions about the series becoming just another overpriced, broken set of books like the Grants now sparkle with the aura of fulfilled prophecy. That issue also heralded the reintroduction of Darrell Schweitzer into the Howardian debate after many years spent in the outlands of Weird Tales and wider fandom, and watching his voice become a staple among the Cimmerian chorus has been a pleasure. Gary Romeo’s takedown of Wandering Star’s editorial policies has been subjected to three years of withering concentrated assaults from “the Orthodoxy” (as he refers to his detractors), but I have yet to see a response that rises above the pedantic to rock the foundations of his core claims, which to my mind remain as impregnable as ever. Even the faults of the issue — the old-style foil on the Deluxe covers, the lack of a Lion’s Den, the inferior print quality and picture repro compared to today, the subtle warping inflicted on the issues due to my soon-abandoned experiments with shrink-wrapping — remind me of how much things have changed for the better in the last three years. $28.50 — usually that kind of a price markup is reserved for publications containing some rare Howard fragment. If TC — the first Howard fanzine to stringently avoid relying on original Howard to buoy its sales and collectability — starts regularly achieving such inflated amounts at auction, it will be a pleasant step forward in our field. For the first time, a journal dedicated to writing about Howard will be fetching significant prices on its own merits, without dangling bits of original REH in front of collectors who otherwise wouldn’t read the magazine. I read a fabulous book last week — John Lauritsen’s The Man Who Wrote Frankenstein, which will be published in May by the gay-themed Pagan Press, based in Dorchester, Mass. Lauritsen, who is known for his work in gay history and for his heterodox views of the AIDS epidemic, sent me an advance copy, which arrived as I was on my way to midterm exams. 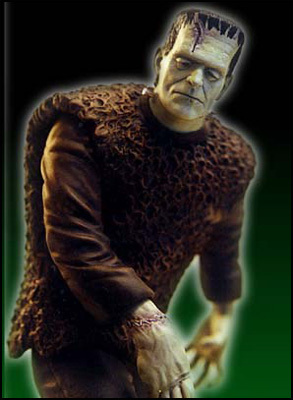 Its thesis is that the poet Percy Bysshe Shelley, and not his wife, the feminist idol, Mary Shelley, wrote Frankenstein and that the hidden theme of that book is male love. As I sat there reading while proctoring exams, I tried unsuccessfully to stifle my chortles and guffaws of admiring laughter — which were definitely distracting the students in the first rows. Lauritsen’s book is important not only for its audacious theme but for the devastating portrait it draws of the insularity and turgidity of the current academy. As an independent scholar, Lauritsen is beholden to no one. As a consequence, he can fight openly with myopic professors and, without fear of retribution, condemn them for their inability to read and reason. This book, which is a hybrid of mystery story, polemic and paean to poetic beauty, shows just how boring literary criticism has become over the past 40 years. I haven’t been this exhilarated by a book about literature since I devoured Leslie Fiedler’s iconoclastic essays in college back in the 1960s. All that crappy poststructuralism that poured out of universities for so long pretended to challenge power but was itself just the time-serving piety of a status-conscious new establishment. Lauritsen’s book shows what true sedition and transgression are all about. Lauritsen assembles an overwhelming case that Mary Shelley, as a badly educated teenager, could not possibly have written the soaring prose of Frankenstein (which has her husband’s intensity of tone and headlong cadences all over it) and that the so-called manuscript in her hand is simply one example of the clerical work she did for many writers as a copyist. I was stunned to learn about the destruction of records undertaken by Mary for years after Percy’s death in 1822 in a boating accident in Italy. Crucial pages covering the weeks when “Frankenstein” was composed were ripped out of a journal. And Percy Shelley’s identity as the author seems to have been known in British literary circles, as illustrated by a Knights Quarterly review published in 1824 that Lauritsen reprints in the appendix. More interesting to me is her comments on how boring literary criticism has become, and the exhilaration that is the gift of the best criticism. The function of literary criticism to my mind is quite simple: illuminate the work being examined in such a way that it can never be read again without recalling the critic’s ideas, leaving the work permanently expanded in the reader’s mind. Within those parameters, anything goes. Humor, wit, audaciousness, anger — I welcome all of these things in criticism as long as the goal of expansion is obtained. Criticism need not — must not? — be boring or plodding, weighed down with footnotes and stylistic rules and lame academic posturing. And yet too many critics become so mired in self-created mazes of pet theorizing and laborious deconstruction that the work itself is not illuminated but lost entirely. Paglia’s right: when a really well-written piece of criticism comes along, it’s exhilarating, and it sends you scurrying back to the original work with eyes wide open, regenerating the old stories and giving them beachheads of modern relevance with which to carry on into the twenty-first century. If Bysshe Shelley becomes the undisputed author of Frankenstein, what will that do to his reputation? If Howard becomes the subject of books written by exhilarating critics with talents and insights capable of expanding Howard’s modern relevance and artistic achievement, what will that do for him, and by extension for the genre of Sword-and-Sorcery? I look forward to the day we have our own stable of Camille Paglias, John Lauritsens, and Leslie Fiedlers in Howard studies, writing books that intelligently challenge and frustrate and inspire, and that force people again and again back to the original works. Just got the Cross Plains Review from early February in house, and fellow blogger [redacted] made the front page with news of his then-impending talk about his new Howard biography. The text of the article, written by Project Pride newshound and Cimmerian contributor Arlene Stephenson, is available at the Cross Plains Library website, and is reprinted below with relevant hyperlinks. The popular Meet the Author series sponsored by the Cross Plains Public Library will feature [redacted] next Tuesday, February 13. 7:00 p.m. at the Community Center. Although Finn, who now lives in Vernon, was born in Abilene, he admits to spending most of his formative years in exotic locations like Sweetwater, Maryneal, Brownwood, and of course. Cross Plains! As an early and precocious reader, Mark discovered the writings of Robert E. Howard at age 12. Like so many, he became hooked for life. Icing on the cake to the young reader was to discover that Howard had grown up and written his many adventure stories from Finn’s own back yard. As a result of his life long interest in Howard’s wide variety of stories and poetry, Finn has become a frequent visitor, and is one of our top ambassadors who is always quick to tout Cross Plains to the world. Finn decided at an early age that he wanted to become a writer when he “grew up.” He laughs that his “earliest fiction has thankfully been lost to the winds of time, and no tears will be shed for them.” However, those early efforts did have value as he continues to hone his writing skills from past efforts. To date, Finn has two books of fiction and hundreds of articles, reviews and short stories to his credit. He also does double duty as the Creative Director for the Violet Crown Radio Players, where he writes, directs and occasionally performs old time radio scripts. His original audio theater version of King Kong was recently nominated for a B. Iden Payne award for best sound production. 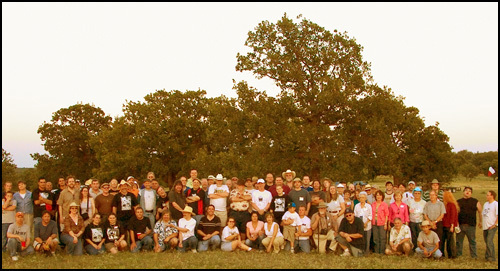 Since 1995, Finn has been a regular attendee of the annual Robert E. Howard Days. Right here in Cross Plains, he met a number of colorful people from around the world who would later become his friends and fellow scholars in the Robert E. Howard United Press Association. Like many of these scholars, he agrees that Robert Howard’s greatest gift to Cross Plains was worldwide recognition. In 1998. Finn became part of the writer’s collective known as Clockwork Storybook. along with Bill Willingham, Chris Roberson and Matthew Sturges. They produced a number of stories and books before disbanding in 2001. Among their more interesting accomplishments was a special online REH tribute issue, wherein all of the stories written for the month dealt in some way with an original REH manuscript — a manuscript that was digitally provided with the generous help of the Cross Plains Public Library, of course. By 2004, Finn was getting serious about compiling a biography of Howard and was once again working with Roberson and MonkeyBrain Books. The two-year project is now in publication as Blood & Thunder: The Life and Art of Robert E. Howard and is gaining publicity as the first book-length biography written on the famous Texas author in over twenty years. Over the years, Finn has brought approximately 30 people to Cross Plains in the interest of showing them his favorite author’s old stomping grounds. Among them was his wife, Cathy Day of the Violet Crown Radio group, who commented on their drive back to Austin, “You know, it’s really frustrating to me that Howard isn’t being appreciated as a Texas author.” The Library is proud to note that Cathy’s comment is the premise of Finn’s coming visit — to discuss Howard as a Texas author influenced by Texas history, economy and environs. Although this event is free to the public, donations are always welcome. Refreshments will be served as patrons mix and mingle and visit with Finn, who will gladly autograph books. Call the library at 254-725-7722 for more information about the evening. I didn’t know anything about the Clockwork Storybook REH tribute, Mark will have to enlighten us about that at some point. 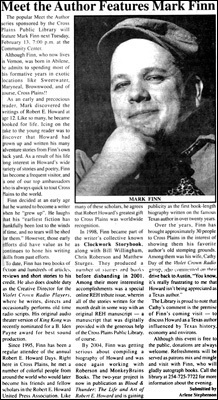 The Cross Plains Library website is well worth exploring for Howard fans. Researchers wanting copies of the REH typescripts in the Library’s holdings can check out their acquisition PDF here. They also have some choice REH items for sale, so check out the For Sale page. I can also recommend another book on that page, On the Banks of Turkey Creek by James Nichols, which relates his growing up in Cross Plains only a few years after Howard’s time and contains much of interest for fans of Howard who want to learn more about that community and the people Howard knew, such as Lindsey Tyson and Dave Lee. You also might want to acquire copies of the Cross Plains Oral History Project, which has captured the reminiscences of such people as Jack Scott, Zora Mae Bryant, Lois Garrett, and Troy Crockett, all names familiar to attendees of the annual REH Days due to their first-hand experiences with the Howard family during the 1930s. And Charles Rodenberger, known for the part he played in the very first Howard Days (an event which Bill Cavalier covered at length for The Cimmerian, in V3n6‘s “How Robert E. Howard Saved My Life”) has a series of book reviews on the site, including one on the Robert E. Howard 1970s paperback collection The Last Ride. It’s an interesting review because it addresses some of the antipathy felt towards Howard by factions of the populace of Cross Plains who decry his treatment of bloodthirsty barbarians as heroes. Perhaps the most gratifying detail in this morning’s coverage of the box office brawn of Zack Snyder’s 300 is the news that in Greece the film demolished records for a March opening. Gotta say, though, the part of me that has always taken the outcome of the Peloponnesian War personally can’t help wishing for a few riots at midnight screenings in downtown Athens. There is not one foot of British ground, not one handsbreadth of soil in England, Scotland, Ireland and Wales that has not been drenched with blood — my own blood — the same that courses through my veins. In every war, I have had kin on both sides. All over the Isles they have marched and countermarched, fought, bled and died, or conquered — men whose blood is in me: Gael, Briton, Saxon, Dane, Norman; Irishmen, Scotchmen, Englishmen. Along comes an Oxford geneticist, Dr. Stephen Oppenheimer, to assert that all of the Britannia-bloodying tribes and peoples Howard listed were in fact “immigrant minorities compared with the Basque pioneers who first ventured into the chilly, empty lands so recently vacated by the great ice sheets.” His article “Myths of British Ancestry” serves as a calling card for his 2006 book The Origins of the British: A Genetic Detective Story , which occasioned a New York Times article this week, “A United Kingdom? Maybe” by Nicholas Wade. For Oppenheimer, author of the earlier Out of Eden: The Peopling of the World, the British Isles are “a genetic time capsule of southwestern Europe during the ice age.” He regards the notion of “a grand iron-age Celtic culture in the center of the continent, which shrank to a Western rump” once the legions marched north and westward, as hopelessly outmoded, and drop-kicks “migrationism,” that war-fueled motor of “The Hyborian Age,” on the basis of fact-gathering employing Y chromosomes and maternally bequeathed mitochondrial DNA. Prior to its repopulation by far-striding Iberians, Oppenheimer posits an unpeopled Britain “wiped clean of people by glaciers that had smothered northern Europe for about 4,000 years.” (But can we be sure? What about the ancestors of the Worms of the Earth?) He speculates that the possibly non-Celtic Belgae who straddled the Channel may have been responsible for English as “a separate, fourth branch of the Germanic language before the Roman invasion,” and draws upon the work of Dr. Peter Forster of Anglia Ruskin University, who, as the NYT article puts it, sees “the Angles and the Saxons [as] both really Viking peoples who began raiding Britain ahead of the accepted historical schedule.” Ahem–score one for Robert E. Howard! Filed in HISTORY — History and REH — TOLKIEN, J.R.R.